What video game would you turn into a Broadway musical? What video game would you like to see turned into a Broadway musical? I’m thinking a Max Fischer Rushmore-esque version of Mass Effect would be excellent. I’d suggest Tales of Symponia, which already has a strong operatic feeling to it, with each character having their own theme. The focus would be on Lloyd and Colette, with Genus and Raine as principle supporting cast, as they journey to try to save the world. On the way, they discover the fate of Lloyd’s mother, travel to another world, meet a host of strange characters who both hinder and help, and eventual fight their way to “heaven” itself. PaRappa The Rapper—not for the music necessarily, but for what they would do with the scenery. The backgrounds in PaRappa all look like cardboard and are constantly in motion, collapsing and rebuilding into new shapes, and that would be amazing to watch. I have surprisingly few answers. The obvious RPG/action game answers make superficial sense because they have characters and plots in place, but they are structured around big moments and set pieces that don’t translate well into staged song and dance because the stories were paced around a different structure. It’s the same problem people run into when trying to create a good video game movie—amplified by 10. This gets even more complicated with sci-fi and fantasy games. It would be extremely hard to create a visual style that would make Krogans and Turians look good on stage. In terms, of meta-commentary on the nature of gaming, I’d love something playing around with Super Mario Bros. 3, which is already about the intersection between theater and games. Or maybe a musical adaptation of Super Mario Maker, playing with ideas of repetition and iteration? But in terms of adaptations drawing directly from game worlds, I’d lean toward prequels and sequels because they would not be bound to stories already written for games. A Portal chamber musical about Caroline and Cave Johnson? Yes please. I agree that the set pieces wouldn’t translate that well, but I don’t think that is a fatal problem. In many musicals, the plot is thin, and the songs are how the emotion is communicated. So I’d imagine, you’d have most the songs and dance numbers focused on the fallout from whatever event takes place. 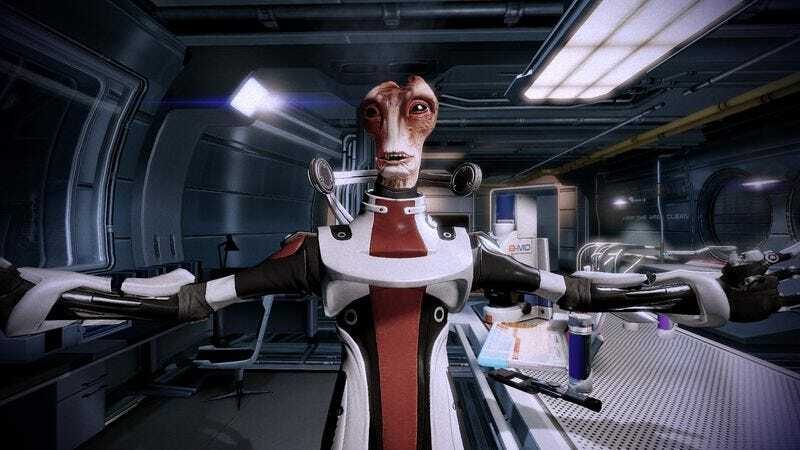 So in Mass Effect, you could have some set pieces with songs focused on the weight Shepard feels in trying to save the world, or Jack reckoning with the torture inflicted on her, or the pain Wrex feels about the Genophage—not to mention how trivially easy it would be to have a musical arc for someone like Mordin. It would be kind of like in One More Time With Feeling, where most of the plot-heavy stuff is told through traditional exposition and the emotional climaxes are handled in song and dance. This question of translating games to the stage is a great one. So great, that I’m thinking we have to revisit it with a more illustrative article somewhere down the line. Me? I’d love to see an epic Dark Souls ballet: No dialogue, just beautiful music, intricate sets and costumes, and the vaguest hint of a tragic narrative. The Family Flam got on board with Skylanders to the point where we had a DVD shelf full of the critters. It was fun, everyone enjoyed it, and George Takei was there! (In the game, I mean.) But Trap Team looked like more of a cash grab than any previous entry, and it will take a price drop on the new one before we dip our toes in again. We pick and choose Amiibo. Toad? YES, OF COURSE. Yarn Yoshi? TARGET AT 8 a.m. But there are too many to collect them all, like so many Pokeymans. Lego Dimensions, had it come out close to the genesis of this craze, might have drawn my interest, but it is more expensive than any other of the toys-to-life games, and what’s more, it comes from a tarnished brand that once promised simple joys with Lego Star Wars but gave way to monstrously unfun volumes (Indiana Jones, Pirates Of The Caribbean) and fun but glitchy sequels (Lord Of The Rings, Batman 2, Star Wars 3) before finally giving players the big middle finger with Lego The Hobbit, a game that covered the first two films and quietly canceled the DLC that would have finished the adventure. I want to be into this; after all, I love Lego and Lil’ Flammy loves Lego, too. But this late into the game, Lego Dimensions needs to be more than “Skylanders + Lego+More Expensive.” The Lego games have worn their niche so deep, it’s now a rut, and this game doesn’t look like it does enough to be different. Mash ups and crossovers happened all the time in ancient mythology. Often, we don’t have much to go on besides the crossover itself, so there’s little context. Maid Marian was likely introduced to the Robin Hood mythos as a crossover, and even in the Iliad, which CNightwing mentioned, Diomedes was the hero of several other epics about the Epigoni war, but they’ve all been lost. I gather that the Iliad actually more-or-less is something like that. If I recall correctly, the Iliad is basically an attempt at crafting a consistent story about Achilles out of a bunch of separate myths about the Trojan War. It’s not quite a mash up; it’s more like All-Star Superman or something like that, where the author picks and chooses out of a mythos to create a story that sort of sums the whole thing up on a thematic level. That does it for this week, Gameologians. As always, thank you for reading and commenting. We’ll you see again next week!